I think the question is an important one. To whomever it belongs, it is owed. One must decide their allegiance based on who the owner is. “Render to Caesar the things that are Caesar’s, and to God’s the things that are God’s” (Mark 12:17). The question whether Israel should pay the Caesar tax has been much abused. Many, if not most, have understood Jesus’ answer in a way that is subversive to his fundamental point. To say, ultimately, that there are two realms or two kingdoms, the nation-state and the kingdom of God (an ancient version of state and church), is to say there are two owners. But–and this is the key point–Yahweh owns it all. Consequently, only Yahweh’s kingdom–only the kingdom of God–has any ultimate claim on our lives as disciples of Jesus. The context of Mark’s narrative is extremely important in this text. Otherwise, as is often done, we might lift Jesus aphorism out its setting and give it an independent status. When we decontextualize his statement then we are free to import a different meaning by recontextualizing in our own setting even without knowing that we are doing so. In this way Jesus’ statement is understood as a piece of American brilliance that separates church and state. This text is set within a string of controversies that contrast the authority of the Jewish leaders with the authority of the kingdom of God. Jesus raised the question whether John the Baptist’s authority was divine or human (Mark 11:) and Jesus underscored that the temple authorities are stewards of God’s vineyard (Mark 12:1-11). God is the owner; no human authority is. Jesus, thus, undermines any claims to authority that the Sanhedrin or leaders might assume. God reigns; human authority does not. It is in this context that the question arises: to whom does it belong? The assumed answer, on the part of Jesus, is that it belongs to God who reigns over the world. The leaders responded to this agenda by seeking to arrest and execute Jesus. But his popularity was too high and his presence too public. Consequently, they had to find a way to either undermine his popularity or enrage the Romans who would execute him, and they thought they had the perfect question to do it. “Is it lawful to pay taxes to Caesar or not? Should we pay them, or should we not?” It is important to note that Pharisees and Herodians posed the question. It was a group effort, and the Herodians themselves were royalists who compromised with Rome in order to remain in power. Either way Jesus answered would get him into trouble. If he said, “Yes,” pay the tax, then his popularity would wane as the tax was a hated aspect of popular culture. If he said, “No,” don’t pay the tax, then the Romans would have cause to move against him for treason and fomenting rebellion. At our distance it is difficult to imagine how politically and religiously explosive this question was. The tax under question is a specific one called kenson (which is a Greek transliteration of the Latin census). When Judea came under direct Roman administration in 6 C.E., this tax spawned a rebellion by Judas the Galilean who, according to Josephus, called collaborators “cowards for consenting to pay tribute to the Romanists and tolerating mortal masters, after having God for the Lord” (Wars, II.viii.1). Finally, when imperial taxes were raised in 64 C.E. the land revolted in 66 C.E. and this rebellion resulted in the destruction of Jerusalem and its temple (cf. Wars, II.xiv.1). Would Jesus dare to say, “pay the tax” and alienate the populace? Or, would he dare to say, “don’t pay the tax” and suffer the charge of treason? The cunning with which the Pharisees and Herodians approach Jesus belies their duplicity. They recognize that Jesus is someone who speaks the truth and is unconcerned by populist or political views. Jesus, they ostensibly believe, will “teach the way of God.” In other words, they attempt to “play” Jesus and encourage him to give a direct answer to a politically-charged question. Playing to the crowd, they affirm Jesus as one who will tell the truth no matter what the consequences. They have baited Jesus like a fish. But will he bite? Jesus sees through the question–he sees their “hypocrisy.” This hypocrisy is revealed when Jesus asks for a denarius (an imperial coin). They have one! Not only that, “they” have one in the temple courts! “They” give him a coin and Jesus asks his own question. “Whose image and inscription is this?” This is a loaded question itself. The term “image” reminds us that Emperors invited worship through their images; this was idolatry in the minds of devout Jews in the first century. To use the word “image” is to conjure up all sorts of “images” of imperial oppression and idolatry, the command to make no graven images, and humans are the “image” of God rather than gods themselves. Further, the word “inscription” only occurs one other time in Mark when one is placed over the head of Jesus on his cross (Mark 15:26). Roman images and inscriptions are hostile ideas in first century Palestine. It is Caesar’s image and Caesar’s inscription. This is not a welcome point in colonial Palestine occupied by Roman legions. The image is Caesar and the inscription makes a claim over the world. 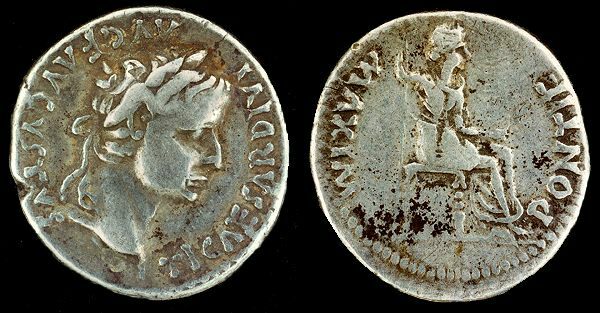 The imperial denarius of Tiberius contains not only the likeness of the Emperor but also an inscription which read: “TI(berius) CAESAR DIVI(ni) AUG(usti) F(ilius) AUGUSTUS,” which means “Tiberius, Caesar, Son of the Divine Augustus.” The image on one side of the coin represented Tiberius sitting on his throne as one who ruled over the known world. The inscription reads “PONTIF(ex) MAXIM(us) or “High Priest.” Tiberius Caesar claims to rule the whole world–both politically and religiously. It claims that Caesar owns the known world. It is little wonder that this coin was unpopular among Jews in occupied Palestine. In fact, Herod the Great and Herod Antipas minted bronze coins for daily use without images to avoid any offense to Jewish sensibilities. The imperial coin, however, represented imperial claims and interests. This is often extended to mean that the state has its own authority such that it may legitimately authorize violence whether in a “just” war or in capital punishment. This is something citizens owe Caesar when asked. Or, this is something citizens owe their state when asked to defend it. This is how Sergeant York came to the conclusion that he should serve his country in WWI according the popular movie (see the clip here). But there is another way to read this which better fits the context as Jesus denies any human authority that subverts divine ownership. The saying is actually antithetical, that is, either it belongs to Caesar or it belongs to God. Render what is owed to the owner. Is Caesar the owner or is God the owner? Is it imaginable that Jesus could have legitimated Caesar’s claims and affirmed Caesar’s ownership when, contextually, Jesus has just denied the ownership of the vineyard by the Jewish leaders? It seems to me that Jesus is pushing the question back on the querists. You decide, Jesus says. If you think it belongs to Caesar, then pay the tax. If you think it violates God’s ownership, don’t pay the tax. In effect, Jesus is non-committal. He will not decide for them but rather turns it back on them for them to answer. What will they do? And, thus, they are caught in their own trap. They have to decide what belongs to Caesar and what belongs to God. This is why, I think, they marvel. This is the only place in the New Testament where this strong word occurs (exethaumazon). They are incredulous; they are stumped. They have no response. Jesus does not answer with a cute–“yes, of course, pay the tax since it belongs to Caesar.” Instead, he turns the question back to his interrogators. Let them judge what belongs to Caesar and what belongs to God. But implicit in Jesus’s answer–if we understand it as an antithesis–is a rejection of Caesar since everything already belongs to God. Caesar is owed nothing because God already owns everything. Jesus is not legitimizing the authority of Caesar. On the contrary, he claims that God is the owner. That does not mean that Jesus necessarily opposes paying any taxes under any circumstances. Rather, it simply means that it is God who reigns rather than Caesar. Jesus lives under the authority of the kingdom of God; he does not live under the authority of Caesar. Jesus will give to God what belongs to God, that is, everything….and that may very well include legitimately paying taxes as part of shared responsibility in a social compact (but that is another topic altogether). This entry was posted on May 7, 2012 at 8:58 am	and is filed under Biblical Texts, Theology. Tagged: Bible-Gospel of Mark, Caesar, Church and State, Kingdom of God, Mark 12:13-17, State, Taxes, Two Kingdoms. You can follow any responses to this entry through the RSS 2.0 feed. You can leave a response, or trackback from your own site. I recognize that Yahweh is not the Greek term for God (theos). Yahweh, however, is often translated by the Greek term kurios (“Lord”). Jesus, as a representative of Israel, confesses Yahweh (the God of Abraham, Isaac and Jacob) as the covenant God of Israel. It is the Hebrew name of the covenant God. Its use reminds us that there is a covenant history in which Jesus participates and fulfills. I have no particular axe to grind other than that point. The coin bears Caesar’s image; therefore, return it to Caesar, whence it came. Each human being — male and female — is created in God’s image (Gen 1:26-27). Humankind is created by God for God and is to be returned to God. Those who understand this distinction must not give themselves to the service Caesar, but only to the service of God.